Tom has had an extensive career singing and acting leading roles across the world, predominantly throughout the USA but has also appeared numerous times on the West End, Broadway, National Tours and throughout the UK. He has played Raoul in ‘Phantom of the Opera’. His Fyedka in ‘Fiddler on the Roof’ with Paul Sorvino as Tevye was noteable for a 4000 person standing ovation at the North Carolina Theatre for his opening solo in ‘L’Chaim To Life’. The role of Clifford Bradshaw in ‘Cabaret‘ at the Trump Taj Mahal in Atlantic City allowed him to win $600 without gambling a penny whilst also enjoying acting without singing for a change! His New York roles include lead role Edward VIII (David) in ‘Only A Kingdom’ at The John Drew Theater of Guild Hall, East Hampton, NY notably playing to such luminaries as Stephen Spielberg, George Lucas and Robert De Niro. Teddy in ‘Gay Divorce‘ at The Lion Theatre, NY was reviewed as ‘the perfect meeting of actor and role’ by one critic. Man 1 in Kander and Ebb’s ‘And The World Goes Round‘ at The Westchester Broadway, NY was the production that taught Tom that he really couldn’t rollerskate. He has even appeared as Frank Sinatra opposite Doris Day in ‘Sentimental Journey’ excitingly staged at El Portal theatre in North Hollywood and viewed by many of Doris’ close friends and contemporaries. In opera Tom has played principal tenor role of Simon in ‘The Emperor’s New Clothes’ at The Kennedy Centre in Washinton DC and the role of Jan in the World Premier of Janacek’s ‘Osud’ at Bard College, NY. In the West End Tom has been seen in ‘ Showboat” at the Royal Albert Hall. He created the role of arch-bounder Charles in Francesca Zamballo’s ‘Napoleon‘ at the Shaftesbury Theatre, West End, the role of ‘Big Macca’ in the original workshop production of Queen and Ben Elton’s ‘We Will Rock You!’ and once again performed for De Niro this time in a producing capacity. He originated the role of Brent Tarleton in the West End and World Premier of Trevor Nunn’s ‘Gone With The Wind‘. 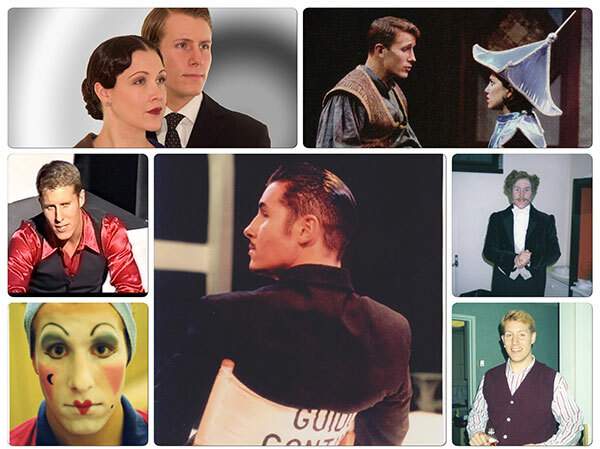 Tom’s most recent run on the West End was a return to stand by as Raoul in ‘Phantom Of The Opera’ in 2012. His favourite roles remain Frank Butler in ‘Annie Get Your Gun’ at the Stafford Gatehouse Theatre, Joseph (entertainingly reviewed as a ‘blond bombshell’) in ‘Joseph and his Technicolour Dreamcoat’ at The Fulton Opera House and Guido Contini in ‘Nine’ at The Bellairs Playhouse. His film work includes ‘Natural Causes’, ‘Gunmen’, ‘Ashton’s War’ and Lasse Halsstrom’s ‘Casanova’.